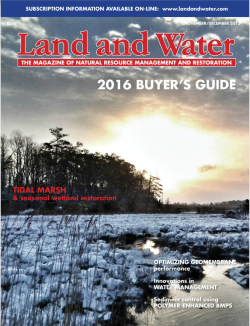 Richie Prejs, our Area Manager for New York, New Jersey, sat for an interview regarding a Super Storm Sandy recovery project that was published in the November-December edition of Land & Water, the magazine for Natural Resource Management and Restoration professionals. Entitled “Taking the Initiative to Protect the Homefront”, the story describes the damage that the storm did to the NY/NJ area and the struggles that one particular homeowner had trying to navigate government regulations and protecting his property from any future storms that may appear on the horizon. You may recall that in October of 2012, Hurricane Sandy came ashore near Atlantic City, NJ. While that was the landfall point, the storm surge and flooding affected a large portion of the state. The storm surge that came with the storm itself was the largest to hit the area since 1900. Once the hurricane had passed, over two million households in the state were without power and 346,000 homes were damaged or destroyed. One area that was deeply affected by Hurricane Sandy was Wall Township in Monmouth County, New Jersey. The nearby inlet allowed for the storm surge into the Shark River. A recently completed boardwalk was destroyed by the surge and damaged cars, houses and utility poles two blocks inland. In an effort to protect their property, a private homeowner decided to take action and create a gabion sea wall. The homeowner provided the funding for this project, but the New Jersey Department of Environmental Protection (Coastal Area Facility Review Act or CAFRA) needed to approve the project due to potential impact to the coast. After navigating the requirements, the home has the protection of a sound gabion wall and a visually appealing finished project as well. To learn more about Maccaferri gabions and other products that were successfully employed in this project, including Spenax Rings and MacTies, please visit our Gabion, Ties and Spirals, Spenax & Rings sections of our website.